From grooving Balkan Gypsy songs like “Ushti, Ushti, Baba,” “Rumelaj,” and “Djelem, Djelem,” to “Valravnen,” a meditiative Medieval Danish song about Ravens taking away the bad luck, this World Music CD has something for just about everyone to like. Like a big, brassy sound? Check out the quintet lineup on the Klezmer tune “Der Rebbe Is Gegangen” and the Serbian dance tune “Merak Chochek.” Ever hear the Dixieland tune “Twelfth St. Rag” played on Bulgarian flute, cornet, and tuba? The group has been around quite a few blocks over the past two plus decades, including multiple tours in Europe as well appearing at the largest folk festival on the North American continent, the Canadian Winnipeg Folk Fest. The band’s instrumentation is as eclectic as their repertoire. When Jutta Distler, Terran Doehrer, and Zoi Doehrer appear as a trio, their three singing voices top off kaval (Bulgarian end-blown flute), mandolin, guitar, tupan and darabuka (Balkan percussion), and drum set. The wide array of sounds is complemented on this CD by the accordion playing of long-time Hi-Duke Velizar Shumanov, the tuba playing of Steven Hart, and the cornet – flugelhorn – saxophone work of Peter Bartels. 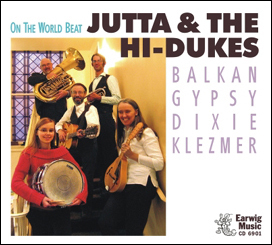 So stay “On The World Beat” with Jutta & the Hi-Dukes! It is a wonderful road to travel when you have seasoned tour guides like these! Special guests on this album include Velizar Shumanov, Peter Bartels, and Steven Hart.